Without knowledge of crochet or knitting, you can still use yarn for some great craft projects. Use yarn to create decorative accents such as wreaths, vases or hollow yarn balls. Kids can create God's Eyes and other crafts with yarn. If you do crochet or knit, these crafts are a great way to use up some stash yarn, especially in small amounts. You can use every bit of yarn for crafting! Love these yarn crafts? Find more ideas for what to make with yarn in our collection, 55 Yarn Crafts without Knitting or Crochet. Yarn Vase- Are you bored with a plain glass vase? Did you pick up a vase at the thrift store but don’t like the colors or design? Wrap leftover yarn around the vase to get a new look. If you don’t have a vase to wrap, use an oatmeal, Pringles or appropriate-sized container. Wrapped in yarn, no one will know! Double-stick tape might be the easiest adhesive for this craft, but you can alternatively paint a thin layer of glue all over the vase or use a spray adhesive. Start at the bottom and make sure to stack the rounds of yarn. Tuck in the end of the yarn under the first few rounds. For a modern look, add stripes of color or one thick strip at the top or bottom of the vase. Solid colors seem to work best for smaller vases. Tuck under the tail end of the yarn when finished wrapping the vase. You can then add embellishments such as a yarn bow, ribbon or use glue dots to add pretty buttons. Yarn Wreath- For an easy decoration, create a yarn wreath. The easiest way to make a yarn wreath is to purchase an inexpensive foam wreath, apply glue or other adhesive and wrap in colorful yarn. Self-striping yarn is especially well suited to this craft. Check out this Spring Wreath or this Yarn Wreath with Berries. For a flatter wreath, you can also use a cardboard circle, salvaged from a large box perhaps. With a 14-inch diameter circle wreath, you would want to cut a 12-inch diameter circle out of the middle. Then glue and wrap the yarn as you wish. You can also use a wire hanger bent into the shape of a circle for your wreath base. Make yarn pom-poms (linked tutorial is for making wool roving pom-poms but technique is the same) or bundles and secure to the wire base. Or for something even easier, just slip scrap balls of yarn in different sizes onto the wire hanger all the way around. Separate large balls of yarn into smaller balls and stagger around the wire base. Yarn Pencil Holder- Wrap yarn around a clean tin can or glass jar with label removed in the same method as the yarn-wrapped vase idea above. Make sure that the layers of yarn are close together so that no gaps show through. This is a great idea to decorate your office space. 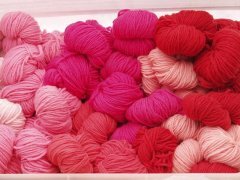 Use masculine yarn for a Father’s Day gift. Hollow Yarn Eggs/Yarn Balls- Making yarn eggs is a really fun activity for kids and makes surprisingly cool decoration. Use spring colors to make yarn eggs at Easter. Hang some of these from a sturdy indoor plant or arranged branches in a vase. You can also arrange in a large bowl for a centerpiece. To make yarn eggs, you need yarn (or embroidery floss), balloons, newspaper, glue and a paintbrush. Mix the glue with equal parts water for a thinner adhesive. Blow up the balloon to around 6-8 inches and tie off (you can experiment with bigger and smaller size balloons for different yarn egg sizes). Secure a bit of yarn or thread around the balloon end to hang. Working over the newspaper, brush the glue all over the outside of the balloon. Wrap the yarn randomly around the balloon. Paint more glue on top of the yarn. Switch colors of yarn if you like and continue to brush glue over new wrapped yarn. You can wrap loosely but do not leave large gaps with balloon showing. Hang to dry overnight. Once dry, pop the balloon with a pin and gently pull it out through a gap in the yarn. Your yarn eggs are done! God’s Eye- A traditional craft from the Huichol Indians of Mexico, God’s Eyes are fun crafts for kids to make. You will only need two craft or popsicle sticks, glue, scissors and yarn in several colors. Glue the craft sticks together at the center to make a cross or plus sign. Take your first color of yarn and wrap it over and around one stick, then over and around the next stick and so on. Keep going around in a circle, adding layers of your yarn color. When you are satisfied with the size of your woven “eye,” switch colors. Simply cut the yarn off from the skein and tie a new color onto the old yarn with a tight knot. Keep wrapping. Change colors once or twice more and tie a knot to finish. While I agree that it would certainly be better with pics, I think most of us know what each (or the majority) of these basic and traditional yarn craft items are. For instance, the God's eye is AWESOME for kiddos and parents to do together for family bonding time. I made those in summer camp back in the day! Thanks for the cool retro ideas! I'm a picture person and without pictures I don't even attempt any craft. My Grankids are not gong to do what they can't see. Pictures Please.